The key to cooking perfect green beans is to actually cook them twice. 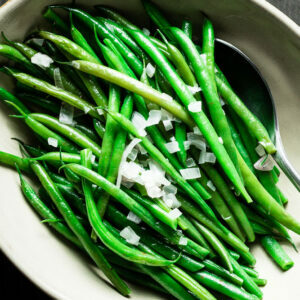 French green beans, also called Haricot Verts are blanched then sautéed with butter and shallots. This is the method used in fine restaurants and comes out perfect every time. 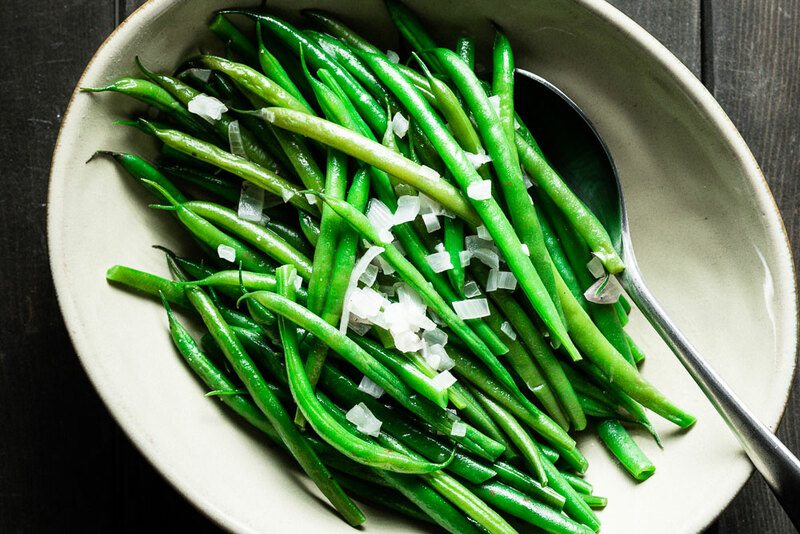 Green beans really are the perfect side dish for so many occasions. Thanksgiving, chicken, steak, fish, ham, and you name it. They can be added to a salad, or made into a salad as a main ingredient, like my Green Bean + Bacon and Walnut Salad. The reason I’m calling these “Perfect Green Beans” is because everyone always asks “how they are cooked so perfectly and taste so great?” The trick is to cook the green beans twice. 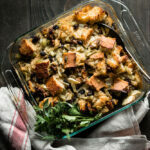 Since they are cooked twice, most of the work can be done ahead of time so all you are really doing is re-heating them before you sit down to the table. Of course, it starts with high-quality produce. If you are in San Diego, the farmer’s markets can be great, but I usually buy my green beans from Specialty Produce. My preference is to get french green beans, which are also called Haricot Verts. If they aren’t available, or regular green beans look fresher, then go with those. You want to buy green beans that have an even green color with no brown discolorations. They should easily snap to show their freshness and the leaves attached to the stems (if any) should not be wilted or brown. This dish is pretty much as simple as it gets. I learned this technique from chefs in a French restaurant. All of the vegetables are prep’d ahead of time for service. While you can cook the green beans in a pan, it can take a little while and by the time the inside is cooked, the outside might have lost its bright green color and end up looking like green beans that came from a can. That’s definitely not what we’re going for. The solution is to first blanch the green beans in salted boiling water, then shock them in an ice bath once they are just perfectly cooked. This immediately stops them from cooking any further and preserves their color. When it’s almost time to serve them, they really only need to be heated up through and seasoned. We do that by placing them in a skillet with a little butter, chopped shallots and seasoned with kosher salt & freshly ground pepper. That goes over medium heat until the green beans are nicely warmed through and they are ready to serve. 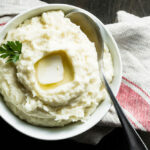 This recipe is a starting point and how I usually serve them, but there are lots of options for changing things up if you want. Clean the green beans by trimming off the stem end (not the other end). Blanch the green beans in a large pot of salted boiling water until they are just tender, but still crunchy, 3 to 5 minutes. Taste them frequently. you can watch the color turn from lighter to darker, but the best way is to taste them frequently. Once cooked, quickly transfer the green beans to a bowl of ice water using a spider or tongs. This will quickly stop the cooking and preserve the bright green color. Add the green beans, stock, and season with salt & pepper. 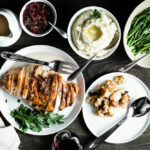 A menu for cooking a stress-free Thanksgiving meal in under three hours.